A very warn update to Xiaomi phone lovers, Xiaomi Redmi 5A is now on saleLet’s grab the smartphone again via Flipkart. Xiaomi is offering affordable and budget-friendly Smartphone, which is available in two variants with four different colours to choose from. Here is a run down on its complete specification and price before buying this budget-friendly smartphone. The Redmi 5A offers you to take 5 percent off if you use Axis Bank Buzz Credit Card. Get extra 10 percent off if IN case, you are a first-time mobile customer on Flipkart. You can also choose to buy the Redmi 5A on standard EMI which start at as low as Rs 291 per month. Hurry Up! The sales stock is quite limited and is quick to finish too. Customers can order the maximum of 2 units every 30 days. The Redmi 5A Smartphone has a 5.00-inch touchscreen display with (720 x 1280)pixels resolutions. It is powered by 1.4GHz quad-core Qualcomm Snapdragon 425 processor with 2GB / 3GB of RAM and 16GB / 32 GB of inbuilt storage expandable via microSD card slot. In terms of connectivity, It includes dual sim, 4G, 3G, Bluetooth 4.1, USB, GPS, WiFi 802.11 b/g/n and 3.5mm headphone jack, and a micro-USB port. Redmi 5A serves with inbuilt proximity and accelerometer sensors. The phone supports a 13MP primary camera with f/2.2 aperture LED flash and PDAF. For selfies, Redmi 5A offers the 5MP front camera with f/2.0 aperture. It has smooth dimensions of 140.40 x 70.10 x 8.40 and weighs 137.00 grams. 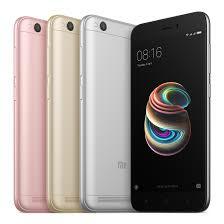 Xiaomi Redmi 5A available in Blue, Gold, Grey, Rose Gold colours and Two models one with 2GB of RAM and 16GB of internal storage. It is priced at Rs 5,999. The second model comes with 3GB of RAM and 32GB of internal storage. It is available at Rs 6,999. Both the models allow for storage expansion via microSD card. A look at Xiaomi Mi A2, Mi A2 Lite Price and Specifications. Moto G6, Moto G6 Plus, Moto G6 Play Launch Expected Price, And Full Specifications. Xiaomi Redmi 5, Redmi 5 Plus Coming December 7th. Install Xiaomi MIUI 9 Update Without Loosing Your Data. Xiaomi’s Redmi 5 and 5 plus Smartphone devices. All MikroTik Cloud Core RouterBoards with Details and Full Specifications. ← Panasonic P101 with 18:9 display launched..Here are specifications.